My idea of fun when I was a kid was to hunch over a magnificent pile of Lego blocks, scan-fling the vast field of multicolored pieces with such sharp concentration you might think I was looking for the answers to life itself I would hide in my room working on Lego projects for hours on end, listening to “Dr. Love,” “Convoy,” and “Fifty Ways to Leave Your Lover” on my AM radio. The other kids in the neighborhood were out playing popularity games to see who got to boss everybody around. I would build stuff out of other things as well, but Legos were always my favorite — they were so quick to put together and take apart again. I would rarely play with anything for very long before taking it apart to build something new. Flying trucks and space battleships don’t really excite me the way they used to, but I still like to build things —like two pairs of single-ended MOSFET power amplifiers. A construction that helps bring to life the greatest music of all time? Now that’s a toy you can play with! I’ve also been upgrading other components one piece at a time, many of the high-quality parts coming from The Parts Connection (a division of Sonic Frontiers). Once you hear the difference a single coupling capacitor or a new power supply can make in your system, it’s hard to stop upgrading. I acknowledge that I have a problem. The Parts Affliction is a hard habit to break, but at least the aftereffects sound healthy. You can imagine, therefore, how I was looking forward to building the DAC-2, the new version of TPC’s highly regarded DAC-1. 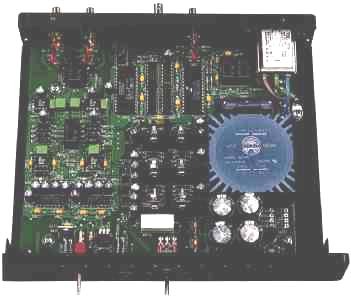 (The DAC-1 was one of Stereophile Joint Budget Components of 1995.) The raw condition in which the DAC-2 is delivered saves TPC some money, and the savings are reflected in the price. I’d probably be willing to pay extra just for the fun of putting something like this together. Getting to build it and getting a lower price seems too good to be true. Still, buying something factory-direct is a tradeoff It Costs less, but you miss out on some services and privileges. A local hi-fi shop can loan you components, make faster repairs, and offer a place to hang out and hear the latest gear. Though such perks are more important to some people than others, they simply can’t be had through mail-order. Description: Digital/analog converter kit with HDCD decoding. Inputs: coaxial RCA, BNC, and Tos-Link optical. Frequency response: DC—20kHz, +0.1, -0.5dB. Signal noise ratio: >102dB. THD; -87dB at full scale. Output level: 2.13V RMS (standard CDs), 4.26V RMS (HDCD CDs). Output impedance: 75 ohms. Dimensions: 9.5”W by 2” H by 7” D. Serial number of unit tested: 9628L0003. Price: $499. Warranty: 2 years parts and labor, 30-day money-back guarantee. Approximate number of dealers: Factory-direct only. Manufacturer: The Parts Connection (a division of Sonic Frontiers, mc), 2790 Brighton Road, Oakville, Ontario, Canada 16H 5T4. Tel: (905) 829-5858. Fax: (905) 829-5388. The DAC-2’s excellent assembly/owner’s manual has detailed, easy-to- follow instructions. If you’re new to this obsession, follow the instructions to the letter. Do not try any “brilliant” ideas of your own, like not pre-tinning (soldering) the ends of the Kimber Kables. Just say no. [ Holey moley! The included Wonder Solder is so easy to work with. I’m used to lead-free solder, which takes forever to melt. Since there are solder rings around all of the board’s screw holes, it appears the designer intended to have electrical con tact with the chassis here. On my sample, however, the ends of the metal standoffs attached to the inside of the chassis were partly painted and oxidized; I got down to the shiny metal with fine-grit sandpaper. Of course, I just had to tweak the construction somehow, so I cut the digital RCA wires much shorter than recommended. Also, instead of leaving them twisted, I separated them by the same distance as the wires that are built into the BNC connector. It will be necessary to unsolder these short wires before working on the circuit board, but this way the RCA input might more closely approximate a true 75 ohm transmission line. Let’s set the record straight. In the beginning was the Parts Connection Assemblage DAC-1 at $449. Then came the DAC-1.5 at $475, identical to the DAC-1 except for the inclusion of the HDCD-decoding PMD-100 digital filter. Now there’s the DAC-2 at $499, a version upgraded sufficiently to justify its own full-grown number. Both the DAC-1 and DAC-2 use 20-bit Burr-Brown PCM-1702 converter chips, the Crystal CS8412 input receiver, and AD844 current/voltage ICs, but they also have many differences. The DAC 2 incorporates the PMD-100 HDCD digital filter, with non-H DCD attenuation performed in the analog domain. The DAC-2 has more than twice the main power-supply capacitance, with 10,800uF of Panasonic HFQ electrolytics. It has 47 instead of 10pF local decoupling caps, and eight volt age regulators instead of five. It uses Analog Devices AD817 op-amps and Holco resistors in its output stage, and adds a BNC connector and a phase- reversal switch. The DAC-2’s parts are, overall, bigger and badder than the DAC-1’s, but this does not automatically guarantee higher sound quality On top of all the included goodies, TPC has made avail able a comprehensive DAC-2 parts upgrade kit for $150, including Kimber RCA jacks and AGSS hookup wire, high-speed diodes, Linear Technology voltage regulators, and Analog Devices AD811 I/V op-amps. (I should soon be writing a Follow-Up on this.) What? You mean the DAC-2 can actually be improved upon? It’s true. 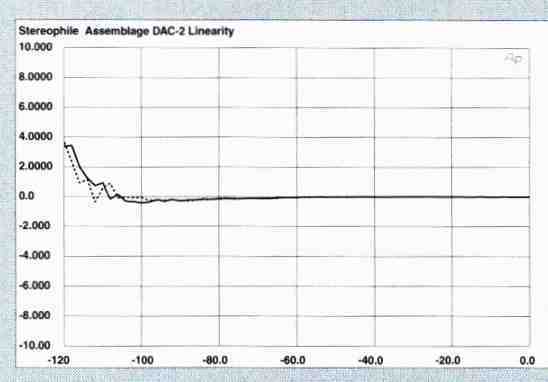 The Assemblage DAC-2's output level was spot-on the CD standard of 2V, measuring 2.002V when decoding a full-scale 1kHz sinewave. The channel balance was perfect, with just 2mV difference in output level between channels. Output impedance measured 75 ohms at any audio frequency. DC levels were very low, measuring 0.6mV (left channel) and 0.3mV (right). The DAC-2 locked to 32kHz and 48kHz sampling frequencies, and didn't invert absolute polarity Fig.1 is the DAC-2's frequency response and de-emphasis error. The response has the typical 0.3dB rolloff at 20kHz, and the de tracking is perfect (it's performed in the digital domain by the PMD-100 filter). Channel separation (fig2) was better than 120dB across most of the band, decreasing slightly to 105dB at 20kHz. This is excellent performance for any digital converter. The left-to right channel crosstalk (dotted trace in flg. 2) was slightly lower than in the other direction. A spectral analysis of the DAC-2's out put when decoding a 1kHz, -90dBFS dithered sinewave (fig.3) shows excellent DAC behavior and a very low noise level. 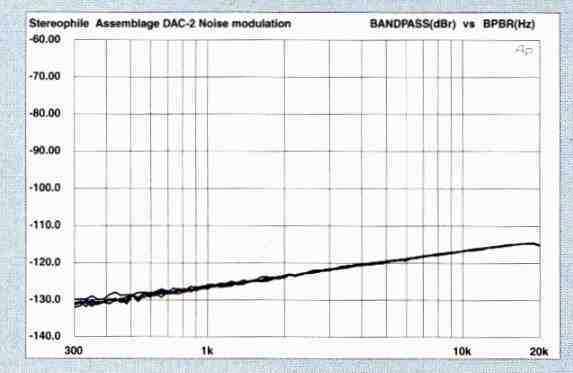 Note the expanded scale (to -140dB) needed to show the DAC-2's low noise. 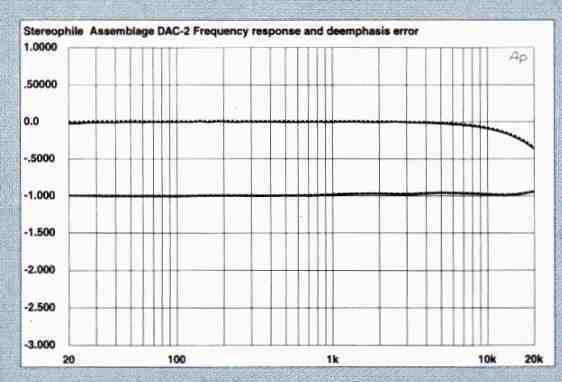 Fig.1 Assemblage DAC-2, frequency response (top) and de-emphasis response (bottom) (right channel dashed, 0.5dB/vertical div). Fig. 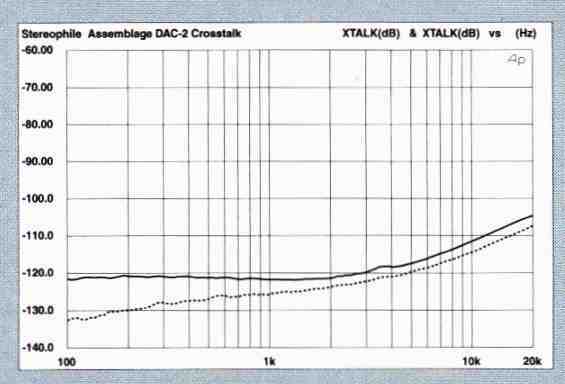 2 Assemblage DAC-2, crosstalk (R-.L channel dashed 10dB/vertical div.). Fig. 3 Assemblage DAC-2, spectrum of dithered right channel dashed). Fig. 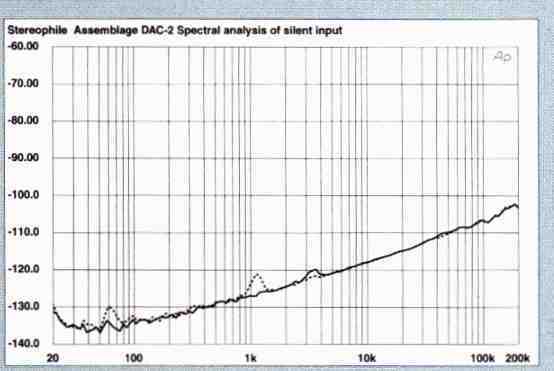 4 Assemblage DAC-2, spectrum of digital silence (20-bit data, 1/3-octave analysis, right channel dashed). 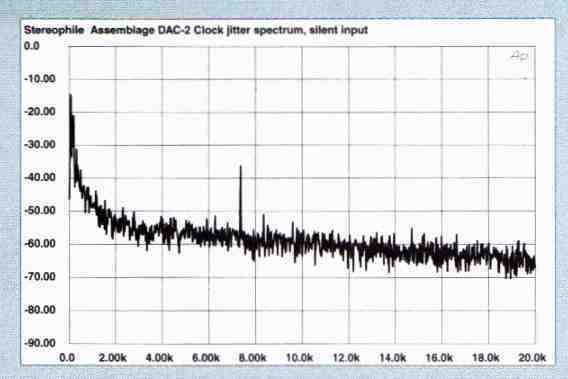 This measurement was made with a 20 bit input signal, which more accurately reveals the processor's intrinsic noise floor A deband spectral analysis (fig.4) made with the DAC-2 decoding an input signal of all zeros showed no unusual artifacts in or above the audioband. We can see a hint of 60Hz in the right channel, which also has a slight blip just above 1kHz in the absence of a test signal. Fig.6 Assemblage DAC-2, noise modulation, -60dBFS to -100dBFS (10dB/vertical div). 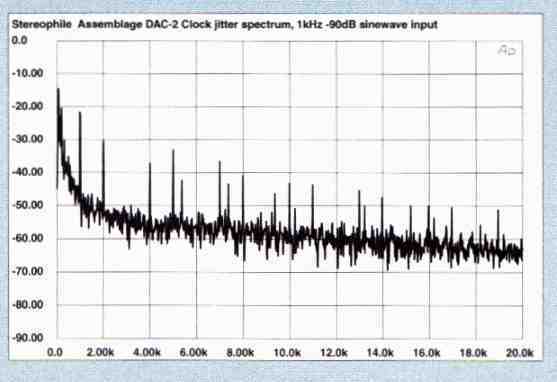 Fig.8 Assemblage DAC-2, waveform of undithered 1 khz sinewave at -90.31 dBFS (20-bit data). 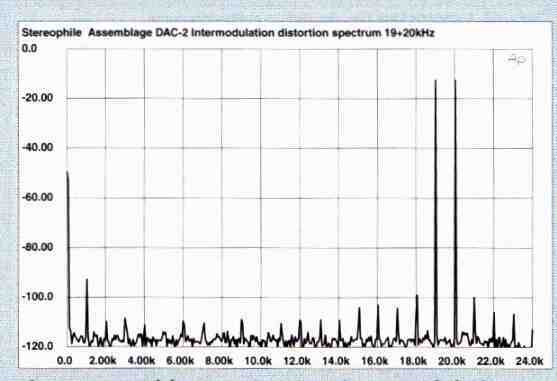 Fig.9 Assemblage DAC-2, HF intermodulation spectrum, DC-22kHz, 19+20kHz at 0BFS (linear frequency scale, 20dB/vertical div.). 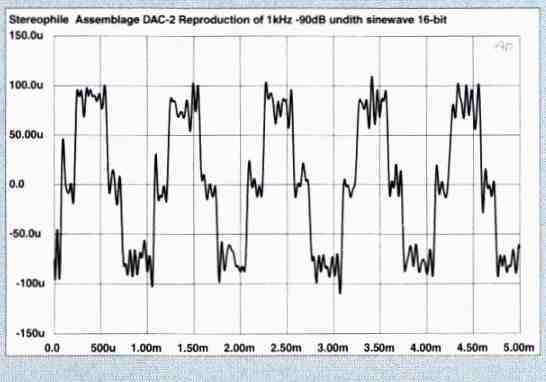 The DAC-2's linearity (fig.5) was excellent, with good performance down to -110dB. The noise-modulation performance was similarly good, with very tight groupings of the five traces (fig.6). 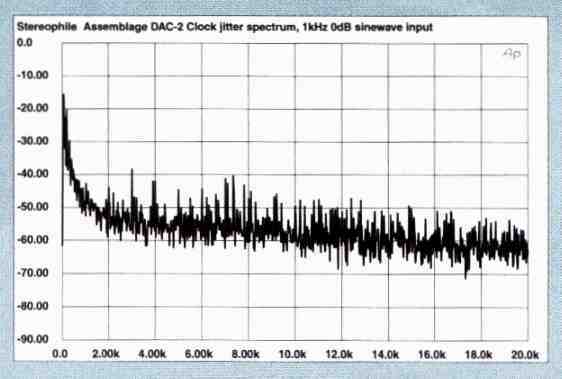 This indicates that the DAC-2 s noise-floor doesn't shift in level or spectral balance as a function of input level, Fig.7 is the DAC-2's reproduction of a 1kHz, -90.31 dBFS undithered sinewave with 16-bit resolution. The quantization steps are uniform, and the DACS have no differential non-linearity. The noise level is also low. 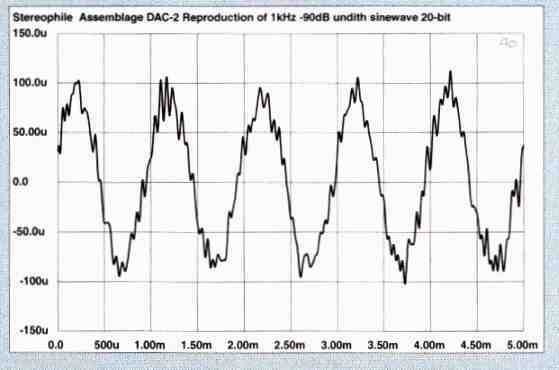 The DAC-2's reproduction of the same signal, but with 20-bit resolution, is shown in fig.8. You can see from figs. 7 and 8 how more bits (longer words) helps low-level waveforms look more like sinewaves. Fig.9 is the DAC-2 s intermodulation distortion spectrum, made with the converter reproducing a full-scale mix of 19kHz and 20kHz. The 1kHz difference component is a little higher than I've seen in most processors, but the rest of the spectrum is very clean, I next measured the DAC-2's clock jitter when driven by a PS Audio Lambda transport using the Meitner LIM Detector. 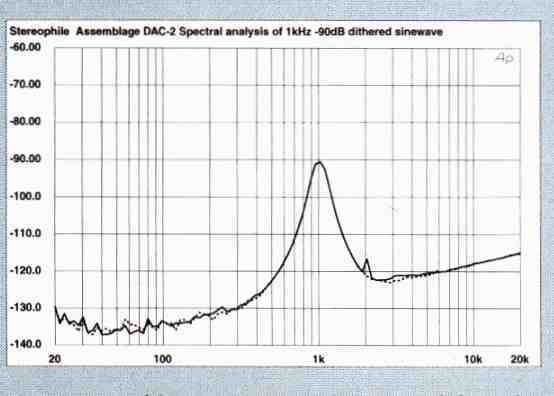 Fig.10 is the jitter spectrum when the DAC-2 was driven by a 1kHz full-scale sinewave. We can see some periodic jitter components (the spikes in the trace), but these are moderate in number and level. The RMS jitter level, measured over a 400Hz-20kHz band width, was a hair under 100 picoseconds. With an input signal of all zeros, which shows the DAC-2's intrinsic jitter in the absence of interface-induced jitter, the RMS jitter level dropped to 7(1 and the spectrum was perfectly clean (fig.11). The spike at 7.35kHz is caused by the subcode carried in the interface, which has a data rate of 7.35kHz. With the jitter torture test signal of a 1kHz, -90dB sinewave, the DAC-2's jitter spectrum shows some strong periodic components at the test signal frequency and its harmonics. The RMS jitter level also rose, reaching 175ps. Fig. 12 Assemblage DAC-2, word-dock jitter spectrum, DC-20kHz, when processing 1kHz sinewave at -90dBFS; PS Audio Lambda transport (linear frequency scale, 10dB/vertical div., 0dB=1ns). All line-level components except for the Rotel RDD-980 CD transport were plugged into the new conditioner. The jitter box was the Audio Alchemy DTIP1us, the preamp the Audio Electronics AE-2. The incomparable Pass Aleph 3 amplifier welcomed the DAC-2 into the system, with my homebuilt Zen monoblocks taking over from there. Speakers were B&W Matrix 804s. The DAC-2 was played continuously for about 50 hours before beginning serious listening. When I sat down in my listening chair with that very serious look on my face, my first impression was Holy Brightness, Batman! My second impression was Wow, this is one great converter— there’s so much detail. My third impression was: What the hell am I going to do with all this brightness. Not having a Cello Palette with which to tweak’n’turn the bright character away, I decided to try changing the system. Let’s see.. . tube amps are famous for that warm, rounded quality; they might fit nicely. 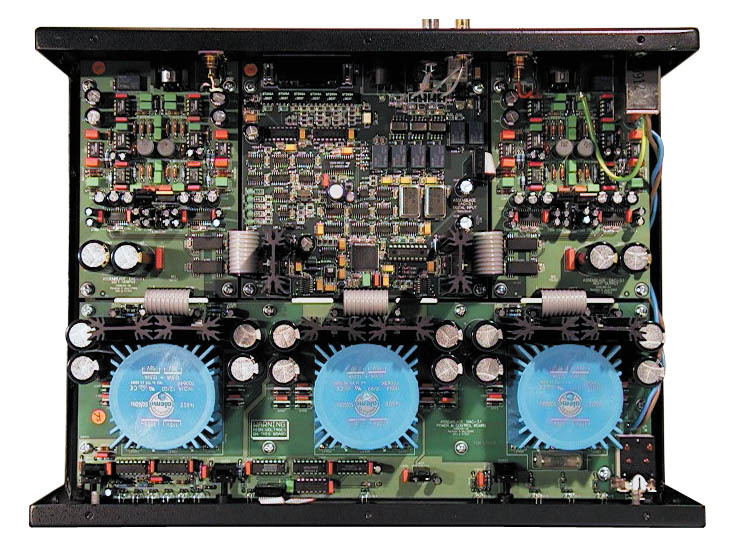 Also, because the designers of the DAC-2 use tubes in their Sonic Frontiers and Anthem lines of amps, they tend to listen to a lot of tube amps. Whaaaat? I have no vacuum-tube power amplifier to listen to? I’ll just have to shoot myself in the head now. Okay, so maybe it wasn’t such a disaster that I had no warm-sounding tube amps. I tried many different cable changes instead, and managed to strike a better balance for the little Assemblage. I ultimately replaced the Sound & Video Digiflex Gold I with the Audio Alchemy Clearstream going into the DAC-2. A touch better. I replaced the TARA Labs RSC Reference Gen.2 interconnects with the far-out-for-the-price TARA RSC Prime. A little better. I replaced the Kimber PBJ with Sound & Video Audiflex Gold V. Better. Then I replaced the TARA RSC Reference Gen2 speaker cables with Straight Wire Maestro. Much better—there was a fairly good frequency balance in the system again. Timbres were recognizable, and I could raise the volume without being driven up the wall. Cool. The processor also mellowed a little with age, becoming more refined as the days went on. The Assemblage could sound lush, with wonderful harmonic body, but only if the recording had such qualities to begin with. For example, Mobile Fidelity Sound Labs’ superior digital mastering of Cat Stevens’s Back to Earth (from their Cat Stevens Three set, UDCD 3-661) is such a disc. Its detailed yet smooth-as-silk sound reminded me of the open-reel, 3oips tape machine that had been spoiling me for the past few days. I’d been recording an album with my now defunct band, Alien Chrome, in Steve Koppe’s analog studio, and on a regular basis listening to the big open-reel machine as well as our live instruments. You might think that after becoming accustomed to sounds like these I’d be repulsed by CDs, but it wasn’t so. Granted, some discs were recorded and/or mastered so poorly that they bore little resemblance to the real thing, and I found these quite disappointing. Yet even these were enjoyable as long as I didn’t dwell on their shortcomings. Putting on Stephen Stills’s Manassas (Atlantic 82808-2) — a bona-fide, mastered-from-the-original-master tapes, HDCD-badge-wearing, High Definition Compatible Disc — was much better. The resemblance in quality to what I’d been hearing that day in the recording studio, listening directly to my own master tapes, was uncanny. I consider this HDCD disc one full step closer to live music. Even MFSL’s fantastic GAIN A/D converter doesn’t come this close to sounding like a master tape — or, by extension, like live music. Too bad there aren’t more HDCD discs available; the sound is pretty irresistible. The little DAC-2 was giving out some good sounds indeed, now that I’d found good partnering cables. The whole sound spectrum was alive and well balanced, with just a touch of brightness remaining. Though not an HDCD recording, Steve Reich’s Octet (ECM New Series 1168) again reminded me of the sound of a master tape. Here the similarity was smaller, I assume because the transfer to digital had not been done with as much care as with the HDCD Manassas. Reich has scored for mostly acoustic instruments in these pieces, so there was a likeness to live sound as well as to a master tape with this CD. The music is neoclassical avant garde, repetitive, ethno-rhythmic, minimalist, and any other good “ism” you want to throw in. Yummy stuff, especially late at night. The Assemblage certainly outperformed the Audio Alchemy DAC-in the-Box and the California Audio Labs Gamma, both priced at $295. Given the price discrepancy, one would expect this. The DAC-2’s superiority applied to any and all important sonic characteristics, proving itself well worth the extra $204. Yeah, sounds like those new parts really do make a difference. I suspect I’m not the only one who had high expectations for the Parts Connection Assemblage DAC-2. Considering the good sound and reasonable price of its predecessor, the DAC-1, the ‘2 would be a decisive best buy if it surpassed the ‘1 in any capability. After many listening comparisons, it’s clear that the DAC-2 surpasses the DAC-1 in almost every capability, rendering the older converter obsolete. The DAC-2 is the best D/A I’ve ever had in my system, revealing musical details on familiar recordings that I was previously unaware of. The DAC-2 provides the listener with subjectively huge amounts of detail. (Depending on the recording involved, some people might think it borders on too much detail.) Its frequency balance is bright, so using dark-sounding interconnects and speaker cable can help balance out the system. Alternatively, using it with a tube power amplifier might strike a good balance. The DAC-2 projects a wide, deep soundstage, and has excellent dynamics. The kit is fun and easy to build. It’s also easy to modify; though care is required — modifications will void the warranty. Despite the standard DAC 2’s high parts quality, an upgrade kit of even-higher-quality parts is available from The Parts Connection for $150. Whoa — if it’s so good already, I can’t wait to hear what this thing will be able to do when I stuff the parts upgrade kit into it.